France in London | Tony Blair: A man to look up to? 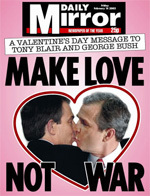 Tony Blair: A man to look up to? I know writing about Tony Blair in the UK is never a good idea. And, with such a title, it is clearly suicidal. Worshipped or hated, the former PM unchains extreme reactions. Last week, I attended a small conference at which Sophie Loussouarn was presenting her new book “L’Odysee politique de Tony Blair” introducing him as a major influence and model for French politicians. I therefore asked myself: is Tony Blair really the man to look up to? Does he remain, even after the Iraq war, the most charismatic and talented European politician of the last 15 years? My point is not to draw the assessment of Blairism in the UK, neither to judge Tony Blair but to underline the symbol he represents and his influence. Indeed, whether one is pro or anti Tony Blair, no one could deny his career is a political fairy tale. Born in Edinburgh in 1953, he studied law at St John’s Oxford but turned out to be way more interested in drama and rock’n’roll than in jurisprudence. He was not the most brilliant student (he graduated only with a Second Class Honours) and wasn’t politically involved. And yet, in 1975 he joined the Labour party and things started moving faster and faster. A charismatic figure, by 1983 he became an MP recognised as a rising star within his political party. The least we can say is that his political party was in deep trouble at that time. Ideologically speaking. Labour was facing severe issues in adopting a clear political line. Members were either kept firmly to the left and were activists or they wished to reform the party by becoming more moderate. Then, looking at their election results, the situation was no better. During the 1983 general election, just after the Falkland war , the labour party reached their lowest score ever: 27.6%. Leaders came and went relatively quickly, without any electoral success and this doom period could be symbolised by the sudden death of the leader John Smith in May 1994. These were rough times indeed! However it was a great opportunity for Tony Blair to establish himself as the man who could reform the party. In 1994, he finally reached the head of his party and launched himself as the “New Labour “ man. Inspired by Scandinavian social democracy and Bill Clinton's techniques, he understood quickly that the world had deeply changed and that the Labour had to face new challenges such as globalisation, environmental issues…The Marxist logic, after the fall of the Berlin wall, seemed clearly outdated for him and that’s why he moved the Party further to the right. From an electoral point of view, this was a major success. 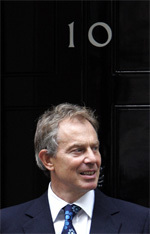 The Labour Party won the election in 1997 and, for the first time in the Labour history, he managed to take the party to three consecutive general election victories. So Tony Blair has been living for 10 years at 10 Downing Street (actually number 11 given that he swapped houses with Gordon Brown), from 1997 to 2007, becoming the youngest PM since 1812. The young Prime Minister quickly became the symbol of a new era, the reformer. He introduced a new style of policy-making with new tools, new methods, new indicators and new values which French leaders have used or tried to copy. More relax, less formal, more pragmatic and pro-active, Tony Blair actually adopted a new way of governing, moving it closer to business management. This new style of governing, for better or for worse, seems to be the way western democracies are going. Blairism, as a way of governing, can be summed up with three main ideas: modernity, efficiency, rationality. The State must act like a regulating actor which individualises and gives responsibility to people whilst helping them, to a certain extent, when necessary. This liberal vision aims at giving a chance to everyone but goes hand in hand with a touch of rigidity… There is no place for assisted people in a modern world. Concerning public expenditure, Blair and his Chancellor of the Exchequer, Gordon Brown, aimed to apply real business methods to public services. Efficiency indicators, balance sheets… the so called “control freaks” put audit techniques into operation in a systematic way and communicated its results regularly. Budget was to be highly controlled and extremely rigorous. It remained viable thanks to increase in numbers of public-private partnerships (at least at the beginning). To be more efficient, the State, as a firm, outsourced sectors and Tony Blair surrounded himself with all kind of advisers. The purpose was to bring people closer to decision-making. In the same way, Tony Blair increased the number of direct participation and the influence of private think tanks. All these new political techniques were organised with a perfect control of political communication in which Tony Blair was a master. Is this type of organisation an example for the future? That’s what France seems to think. 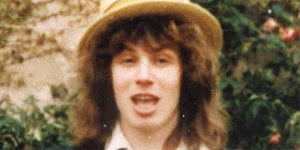 Tony Blair has always been very close to the French. He speaks French perfectly, used to spend his holidays in the south France and has a lot of acquaintances on the other side of the Channel. Besides, for a few years he has been the politician to look up to whether from the right or the left: Guest of honour at the annual UMP meeting in January 2008, debater in a conference about the future of capitalism organised by Eric Besson, even PS leader Martine Aubry wrote the French preface of his book... So, Tony Blair, is a super star in France. 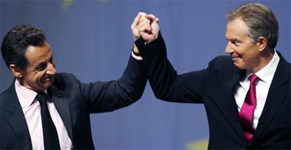 Nicolas Sarkozy affirmed he is one of his major references. When he was Ministre de l’Intérieur, Nicolas Sarkozy said that Tony Blair was the foreign leader who impressed him the most. And this admiration was not about to stop since the former British PM was clearly a source of inspiration during his campaign and for his presidency and even going one step further. Pragmatic reformer who is not afraid to cross the line, charismatic leader who has always a new idea in the pipeline, Tony Blair is an example of political courage and energy. The “Third Way” he created above the traditional and hermetic political boundaries helped inspire Sarkozy’s idea of a mixed government. 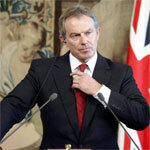 The French President affirms Tony Blair is a friend and, in 2007, an interesting slip of the tongue made him a member of the right wing political party… At the UMP national meeting, Tony Blair was full of praise for his host as well and summed up why the two men were so close ideologically speaking. “In a changing world, woe to those who laze.” Support to Nicolas Sarkozy’s reforms or cutting remark addressed to the Socialist Party? Probably both. Indeed, the relationships between Tony Blair and the PS have not always been easy. As Tony Blair was at the UMP meeting he said “In the UK I am Labour, in the US I would be a Democrat, in France… I would be in the cabinet! No I’m joking, I would be a socialist but one of them who try to reform.” As for the French, their big British neighbour was embarrassing and its Third Way mostly inconvenient for a party which aims to fit with its left wing legacy. “Blairist” has been a common injury in French left, meaning “right-wing oriented”. To be friend or not to be friend with Tony Blair? This is the question and it has been haunting the French left-wing politicians since 1997… And it didn’t get any easier given that Tony Blair emphasised their archaism in comparison with his own modernism. The Iraq war made the rest: the divorce between the French socialists and “Bush’s poodle” seemed to be sealed… And yet, despite all that, Blair continues to fascinate the members of the French PS and has become a model. Former candidate Ségolène Royal was not ashamed to say so and to express her admiration for him during her campaign. And how could it be otherwise? Whether you totally agree with his ideas or not, if one leader of the French PS could mirror Tony Blair’s actions in the Labour party, the PS could see the end of its crisis. Indeed, Tony Blair shattered the old labour party and re-launched it as a political winning machine. Does it mean that Blairism is the future of the French PS? Only history would be able to judge Tony Blair but he clearly left his mark on the political world. His legacy is so important that it overshadows the political left / right conflict in France and that even Barack Obama says he holds him as an example… No less. So, calling his career an odyssey appears adequate and, if you want to find out more, read Sophie Loussouarn's book! PS: Don’t shoot the messenger!